ARTWORK PROVIDED BY IBERO AMERICAN DEVELOPMENT CORPORATION. 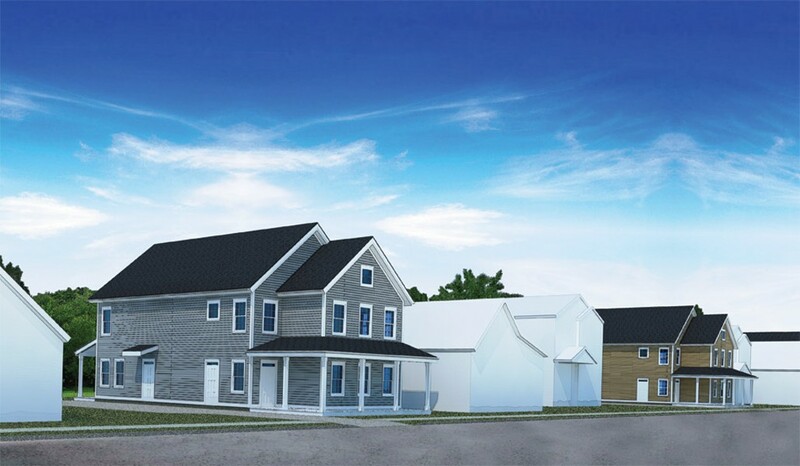 Rendering of one of the three-family homes planned for vacant lots in the city's northeast. Hoeltzer and Sullivan Streets are short and narrow one-ways with a mix of modest homes and duplexes, some of which are deteriorated, vacant, and boarded up. Similar to many streets in this northeast section of the city near Joseph and North Clinton Avenues, they've become enveloped in a sprawling patchwork of vacant lots that meanders through the area's residential and commercial blocks. But Hoeltzer and Sullivan may be about to undergo a major change. The Ibero-American Development Corporation is planning on building Pueblo Nuevo, a $35 million affordable housing project consisting of 104-units spanning multiple dwellings in some of North Clinton's neighborhoods. Many of the vacant lots on Hoeltzer Street, Sullivan Street, and Kappel Place will be in-filled with new construction, which will dramatically alter their appearance. The city's Planning Commission last month voted 7-to-0 in favor of the project, all but assuring that Pueblo Nuevo will move forward. Previously, the Zoning Board of Appeals approved a zoning change that'll allow the construction of two- and three-family residences. The project is a result of the El Camino Revitalization Area Community Charrette, which took place in August 2016, and its one part of a larger and long-term plan to uplift the North Clinton area, widely recognized as the heart of Rochester's Latino community. The area has also struggled to rid itself of drug trafficking. Pueblo Nuevo will consist of a combination of single-family homes, duplexes, and triplexes on Hoeltzer, Sullivan, and Kappel Place, and a two-story, 22,000-square foot, 16-unit multifamily dwelling on Sullivan. Also, the old school building at 938 Clifford Avenue will be converted to an 18-unit multifamily dwelling. All of the units will be rentals consisting of one, two, and three-bedrooms.And some units will be designated for intellectually disabled tenants. The units are available to everyone, subject to income verification, Marlin says. He declined to provide rent rates, but he says all of the rents will meet state guidelines for affordable housing. "We have enough units here to make a transformative change to the area," says Eugenio Marlin, IADC's executive vice president. "There will be more eyes on the street with that many people and some of the issues that have plagued the area will be greatly reduced." However, not everyone in the neighborhood is as enthusiastic as Marlin. Some residents have complained to city officials about the size of the proposed buildings and a parking shortage, they say, is sure to develop with such a sharp increase of residents. IADC met with neighbors several times and developed a design plan that reflects the history and culture of the area, Marlin says. But Andrew Cehelsky, a long-time resident on Hoeltzer Street, says it's too much new housing for streets like his. The triplexes are out of scale with most of the other buildings on the street, he says. IADC held meetings, but they were sparsely attended, and most people don't understand the consequences of increasing density in a neighborhood, Cehelsky says. "There's going to be one of these big box buildings next to me," Cehelsky says. "They block out the sun. You're looking at a wall." Cehelsky was one of more than 30 area residents who signed a petition asking the Planning Commission not to approve the project. But the Planning Commission had to consider several things in making its decision to approve the project, says Zina Lagonegro, the city's zoning manager. "We have a lot of vacant land there and there's not a lot of people lining up to buy vacant land," Lagonegro says. "And Ibero will be managing the properties and they have a good track record."